It's almost October 31st which means discounted chocolate from your local grocery stores and cute kids in even cuter costumes are right around the corner. This year I'm being sponge bob, as a 24-year old it's more of a funny costume than cute, so I will spare you those photos. Instead, I'll share some cute curly kids in adorable costumes to help get you through your week and maybe give you some last minute inspiration for your mini me's. What's cuter than Bruno Mars? Baby Bruno Mars. Fitness guru Massy Arias' daughter as Frida Kahlo and then as Solange from Cranes in the sky. The children are our future, but the women form Hidden Figures paved the way. 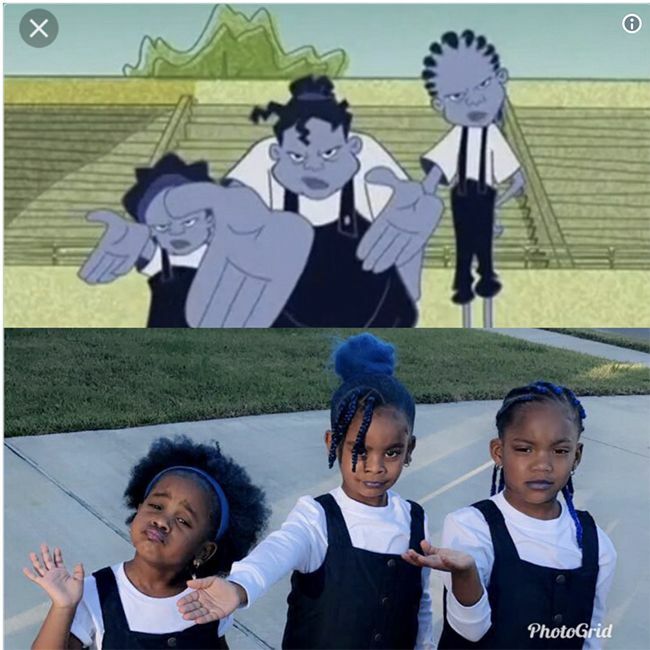 Ziya's mom, beauty and lifestyle blogger Raven Elyse gets creative with her daughters costume each year. Parents may be the protectors 364 days of the year, but this Halloween the kids are taking over and saving us..mostly just from eating too much of their candy. This family absolutely killed this look. Goals. Serenity leads the Oz crew across a grassy field as the tinman, but I'm pretty sure she has a big enough heart for all of us. Nylah as Dorothy. Look at those braids! Serenity and her mom Angela perfected another look for Halloween this year, and I'm sure it will leave Dalmatians SHOOK after seeing their version of Cruella De Vil. Brandy G's son dressed up as a dragon, but he looks a bit too happy to play any tricks this year. I thought it would be fun to add a couple Halloween pictures from us here at the NaturallyCurly office. #throwback My mom always says this was my favorite costume, I was Barney 3 years in a row! NaturallyCurly designer Cara as a genie. Who taught her how to smize like that?! NaturallyCurly editor Devri, can you guess her costume? Video Editor Grace as Cruella De Vil, she's still this fierce-a bit nicer though. Lizzie, our Digital Account Manager, as a 50's sock hop gyal. My younger siblings as bees for their first halloween 9 years ago. Why let hair dictate your child's costume? Let your child know they can be anything they want this Halloween, kinks, curls, coils and all. What were some of your favorite costumes as a kid and what are your curly kids going as this year? Share in the comments below!